Scientists have warned that partridges and turtle doves are disappearing at such alarming rates that without urgent action they may cease to exist in the UK. The number of grey partridges, estimated at around 43,000 pairs, dropped by 30% in the five years to 2010, according to the latest wild bird statistics, published by Defra on Thursday. 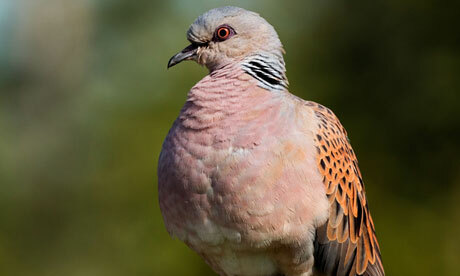 The turtle dove population, estimated at just 14,000 pairs, is in even greater decline. There has been a 60% drop in numbers over the same period. “Losing six out of 10 of our turtle doves and three out of 10 grey partridge in five years is nothing short of an unsustainable wildlife disaster,” said RSPB scientist Mark Eaton, “The turtle dove is in a great degree of danger – if this trend were to continue we could be down to fewer than 1,000 pairs by the middle of the next decade, with complete extinction a real possibility. This entry was posted in Birds, Nature, Wildlife and tagged Christmas, conservation, countryside, partridges, RSPB, turtle doves. Bookmark the permalink. This is indeed a “wildlife disaster”-I do hope steps are being taken to resolve this problem! It saddens me that my grandchildren may never know the beauty of this good earth as I have. On the second day of Christmas, my true love gave to me…. Here is a reblog on the current state of affairs of these birds.